The creative madness doesn't cease there, because, later in the game, Democratus is forced to expand back to its original size in order to get you out of a tight spot on a comic book villain's spaceship (it's a long story ...) This scatters other members of your party to the planet's surface, launching several individual mini-levels that literally take place on the body of your party's most spherical member. Not a situation you encounter all that often in RPGs, and only made possible due to the nature of Democratus' character. While the best RPG sidekicks are given depth through interesting interactions and a compelling back story, Democratus' fractured and complex nature is instead shown through literal and ingenious exploration of the planetary surface. Players get to experience this directly, without any convoluted use of flashback. This unique characterization can only work thanks to Democratus' planetary nature, and contributes to an RPG experience that has rarely been bettered. As Anachronox fans know all too well, the game concludes with the promise of a sequel which never came. 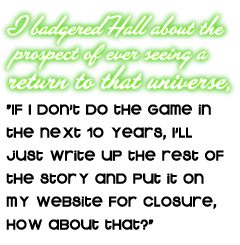 When I badgered Hall about the prospect of ever seeing a return to that universe, he offered this small crumb of comfort: "If I don't do the game in the next 10 years, I'll just write up the rest of the story and put it on my website for closure, how about that?" Closure is one thing, but there's a part of me that dearly hopes he'll eventually reunite with Richard Gaubert and the rest of the team to give the game a proper send-off. In Hall's own words, Anachronox was "made for the love of it," and that's not a feeling you can simply let go. Meanwhile, the adventures of these fascinating characters remain unresolved. Democratus is still out there, somewhere, rotating silently on an axis of hilarity and political incompetence. Peter Parrish would just like to add "Then DIE, little Heinz. Just DIE."